I’m running a game of Paranoia at the weekend, and to torture myself with extra work I’m messing around with a new system – which I’m currently calling the 214 System. Character generation involves selecting a Mutation, Secret Affiliation and Loyal Workers card – each of which lists facets of your character. In practice all three denote skills, but also represent things you shouldn’t be openly using for fear of punishment and laser-based retribution. In addition, all characters start with 3-points of Power and Access (arbitrary number that I might adjust). Power represents the individual’s ability to bring their own talents into play – whether they’re skills, kit, environmental factors, or whatever. Access represents the connections and influence the character has – those ways and means outside of their immediate control that can nevertheless help. When a character faces a challenge, they need to roll a 7 on two 6-sided dice. No more, no less. Before they attempt the challenge, they can play cards to help them. They can use one or more from their available Character Cards, but the play has to be relevant – or coaxed into play with a good explanation or excuse – and it ‘taps’ the card, so it can’t be used with the next action. You roll the dice and succeed with any result of 7, whether natural or adjusted by card spend. If you can’t get a success, your team can help you succeed. They can spend Power or Access to do this. Power spend is 1-to-1, while Access is 2-to-1 – as the players connections are unlikely to want to assist someone else. If no one chooses to assist, you can spend from your own pools of Power or Access. As it’s harder to coax your own abilities to a better outcome (that’s what the dice roll represented), you need to make a 2-to-1 spend of Power. On the other hand, your connections and affiliations do want you to succeed, so you can spend your own Access on a 1-to-1. At the end of this, if you have any result of 7, whether natural or adjusted, success follows. Any other results fails and the character suffers the consequences. The player draws a benny from a bag (poker chips) and the value on the benny can be applied as desired. So, it might say 2 Power. The player can either take it and add to their pool – and explain what this success looks like. Or, they can apply it to someone else in the scene – subtracting it from an opponents Power pool, for example, as a wound. If a team member’s spend got the 7, they get the option of the benny. So, the active character battles the traitor and backs him into a corner, but another team member takes the 2 Power boost for his own pool, as she takes advantage of the distraction to move into a better position, manages to open a door to get access to a safer area, or spots a weak point in the opponent’s attack pattern. If the active player used a card to attempt to adjust the roll, a team member can trade their option to draw a benny for a piece of incriminating evidence instead, relating to one of the Cards used. 1. Explain what you’re doing and what you want to achieve. GM explains the consequences of failure. 2. Player commits one or more cards and explains how they help, given the situation. Tap each spent. 3. Player rolls two 6-sided dice. 4. If they roll 7 (or an adjusted 7, achieved through card spends), they succeed. 5. Other team members can spend from their Pools to drive success. 6. 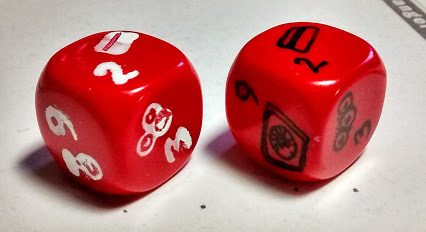 If the adjusted roll hits 7, the character doesn’t fail, but the team member gets to choose where the benny goes. Or claims incriminating evidence based on a card spent. 7. If not adjusted to a 7 yet, the active player can choose to spend from Pools to drive success. 8. If the adjusted roll hits 7, they succeed. Otherwise, they fail and consequences ensue. The GM gets the benny and can apply it how she chooses. As I’m playing with friends, I hope they’ll forgive me making them guinea pigs for my testing of the idea. I’m likely to concentrate on telling the story and fiddling with the rules rather than hammering the rules home at the expense of the tale. Why the 214 System? Well, it adds up to 7. And throughout PARANOIA XP, the Year has always been 214. Just seems to fit.